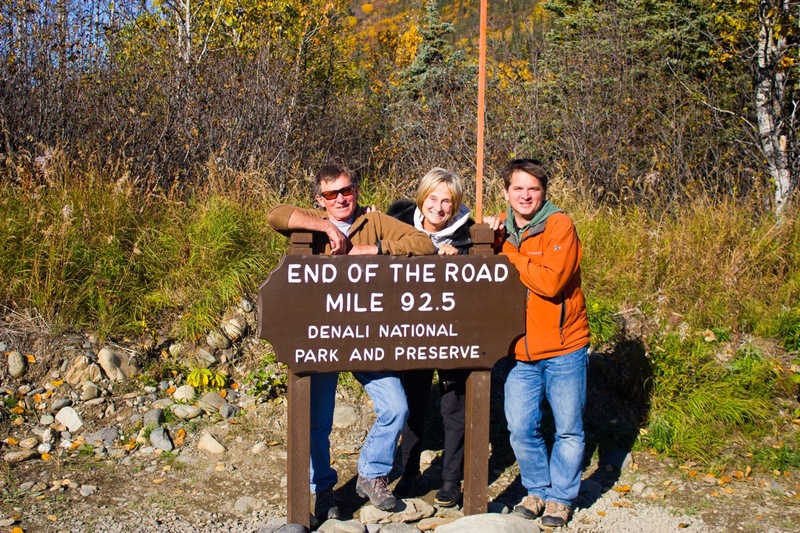 On September 16, 2013, I drove into Denali National Park and Preserve with my parents. It was a spectacular day! 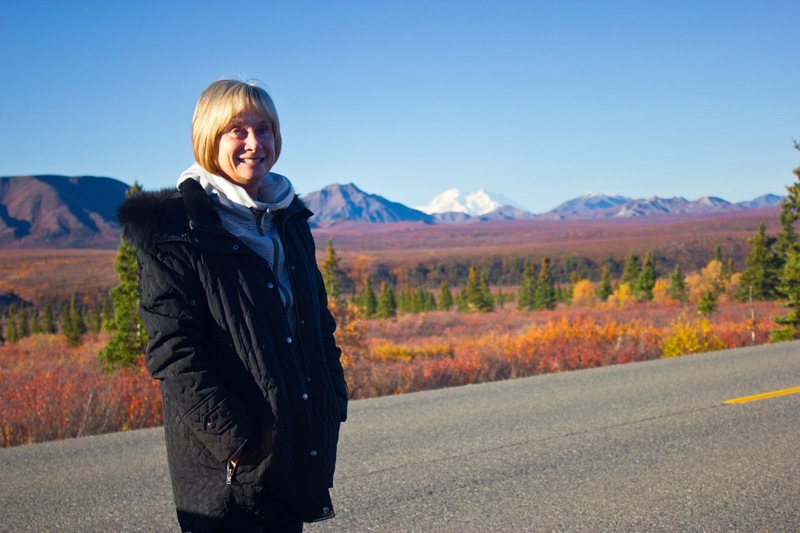 The remarkable thing about the trip was that we got to drive into the park in our own car. Normally, only busses are allowed on the park road. So if you want to see Denali, under normal circumstances you have to do it with a bus load of people. Once a year, they allow cars to drive the park road. You ability to do so is based on winning a lottery. I don’t know all the facts, but only about 400 cars get to do this a year. 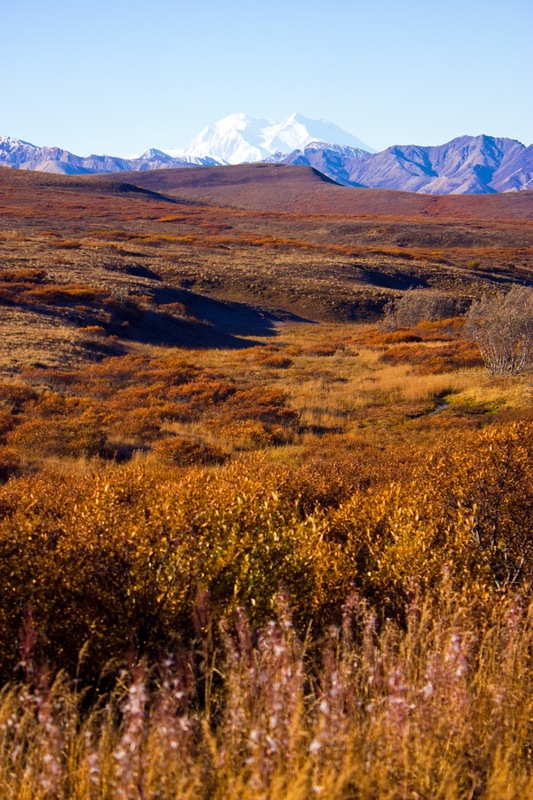 The opening is in the fall for four days, usually at the tail end of the tourist season. We were extremely fortunate to have crystal clear skies for nearly the whole trip. 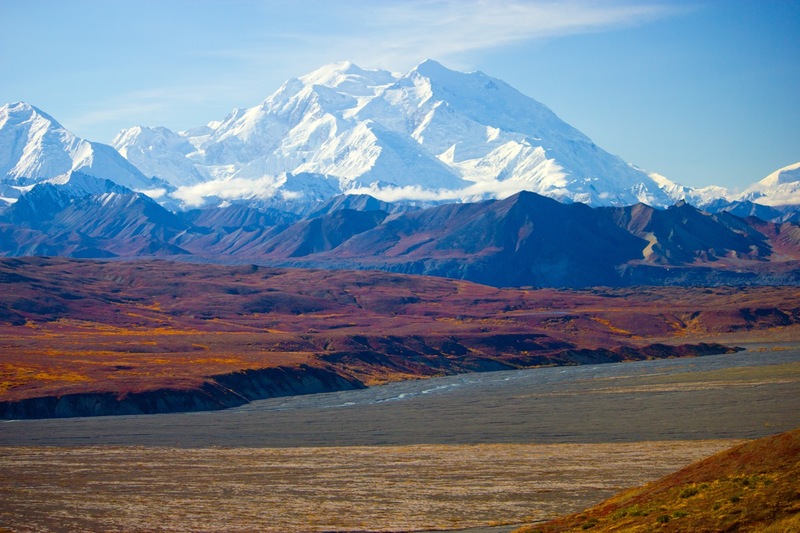 Each year, thousands of visitors come to Alaska, and many of them don’t ever get to see the mountain because of poor weather. We were truly blessed with these views. The park road is 92 miles to a place called Kantishna where there is a landing strip. We made it the whole way! In all, we were on the road for about nine hours from start to finish. The entire way into the park we were greeted with exceptional views of the mountain. Here was one of the first. The road it paved for the first 15 miles. Beyond that the road is gravel and barely a land and a half wide. Regardless of the condition of the road, you are afforded incredible views of the mountain. As you can see, the fall colors were out in force. I was told that the week before, the colors were even more intense. I was still very pleased with the level of color that we saw. 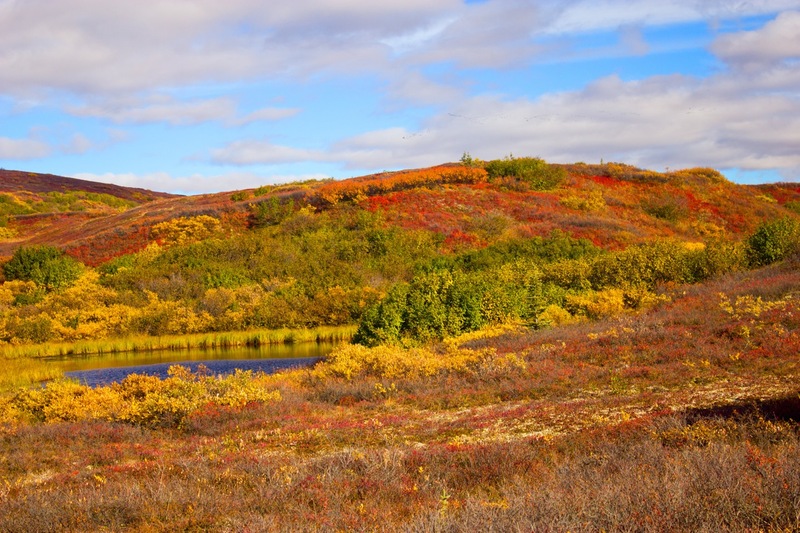 Red, golds, yellows, and oranges abounded throughout the park. There was even some green here and there, but mostly that was from the spruce trees. 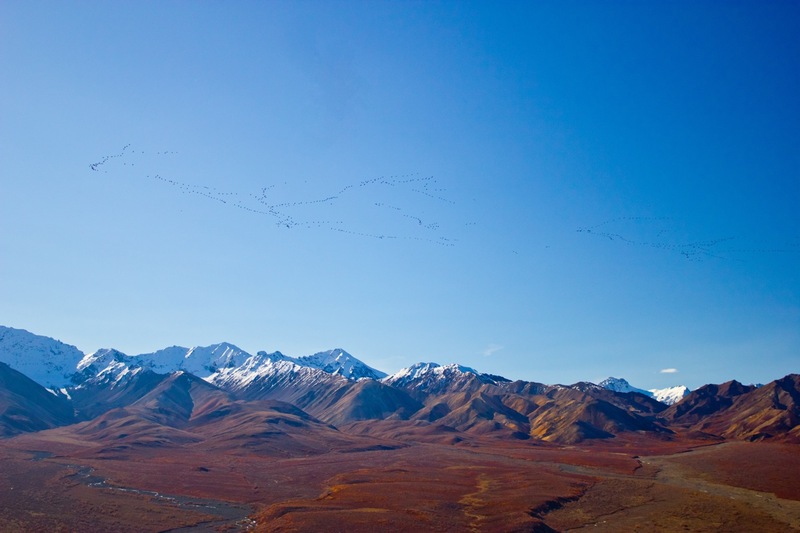 When we arrived at a place called Polychrome look out, were were rewarded with one of the most incredible natural sights I’ve ever seen-a sandhill crane migration. The photograph doesn’t quite do it justice, but there were waves and waves and waves of cranes flying through the park. 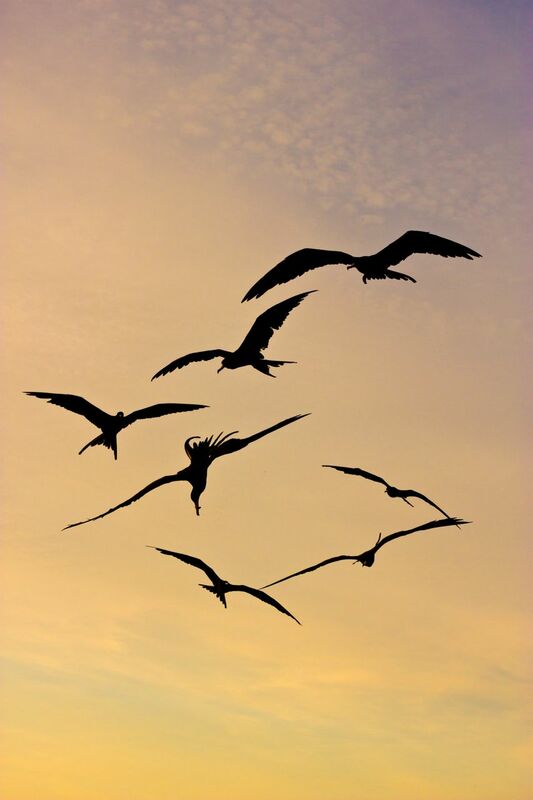 They would be flying in organized lines and then suddenly chaos would ensure. They would circle around in chaotic waves. Then after a few turns, they would form back up and fly away. We were told by a park ranger that they were gaining altitude. 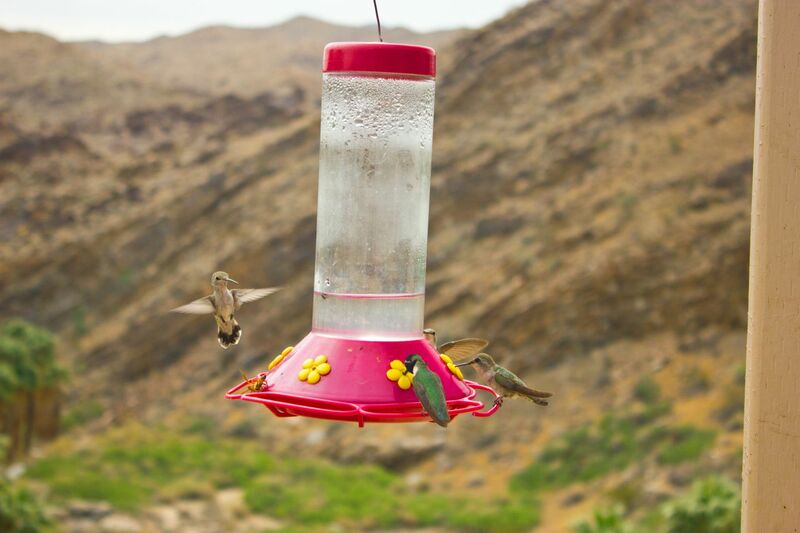 Here is a video of the birds. Take note of the din that comes from these birds. Polychrome Overlook was so vast. 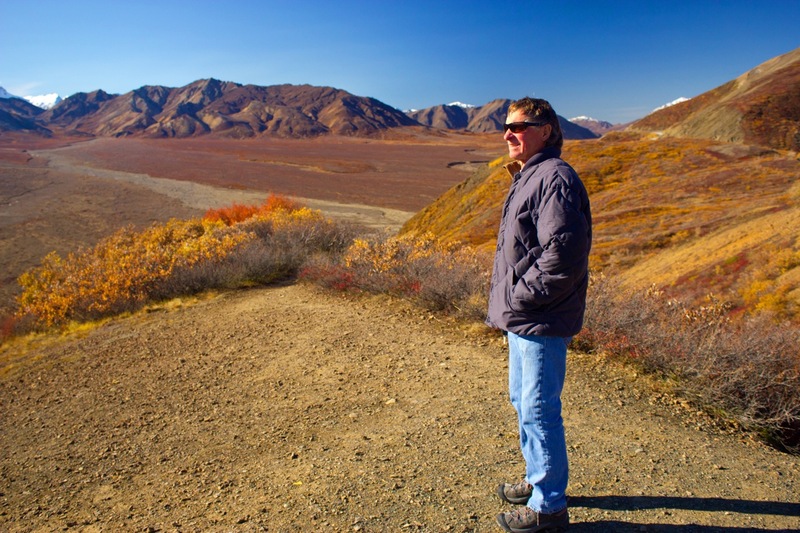 Here a shot of my Dad looking at the surrounding countryside. Obviously the mountain is what you come for. It is truly spectacular. However, there are other gorgeous sights in the park. The landscapes are tremendous and large. You get it all too. 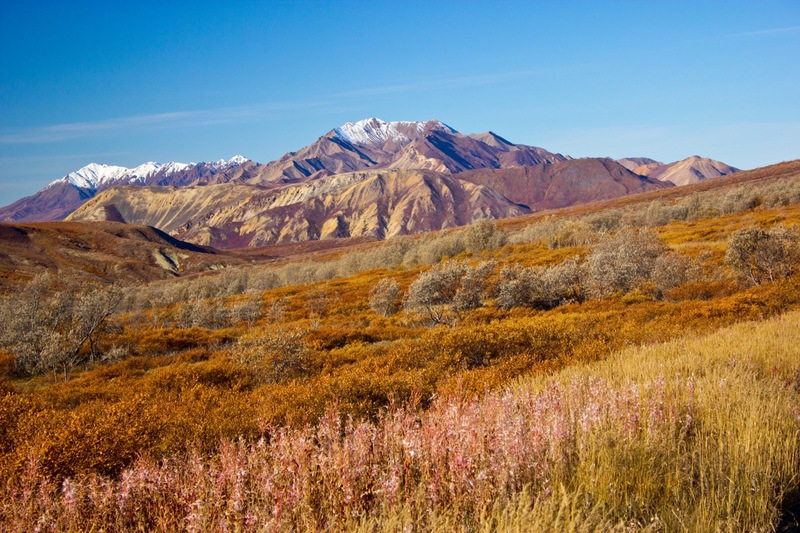 Snow, color, mountains, stream beds. Everything. As we drove through, I was taken with the similarities between Denali and Joshua Tree. Both are hidden gems in the normal general surrounding landscape. 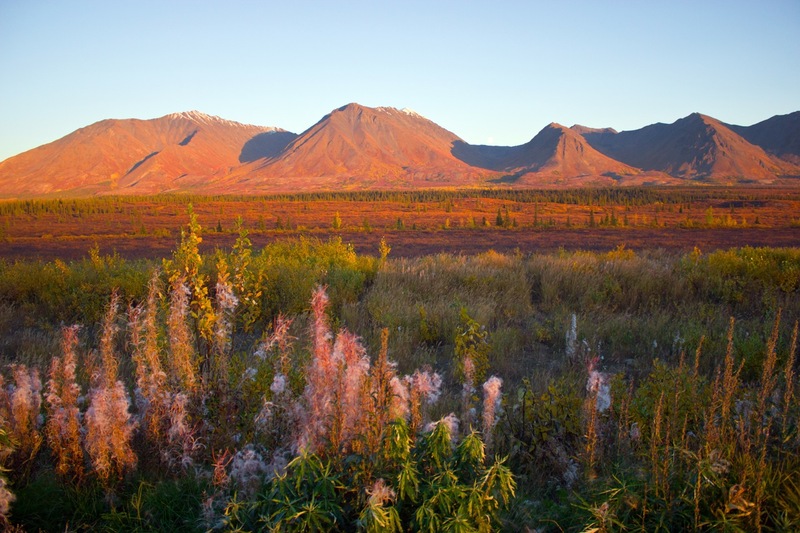 The areas in and around both Denali and Joshua tree are nice and remarkable in their beauty. 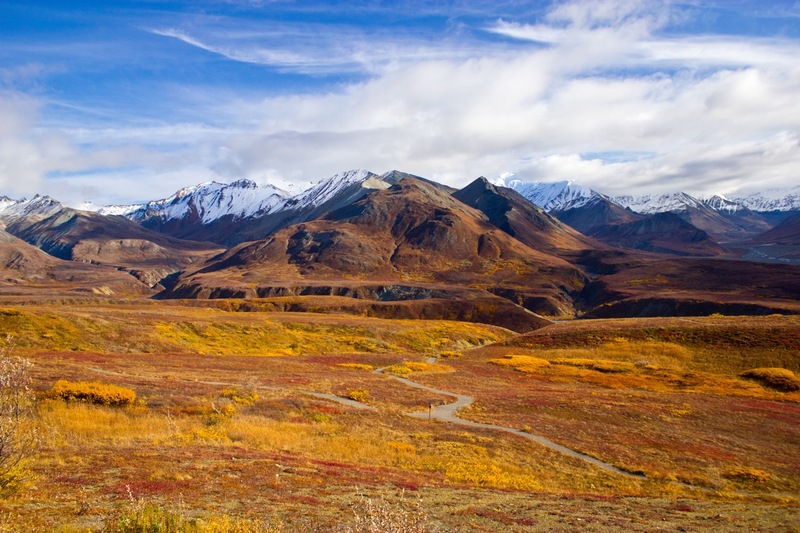 For instance, this shot was taken on the Parks Highway, about 20-30 miles from the entrance of Denali Park. I took it the night before as I drove up to the park. That’s not too bad. Quite beautiful, particularly from the sunset standpoint. But this is inside the park! 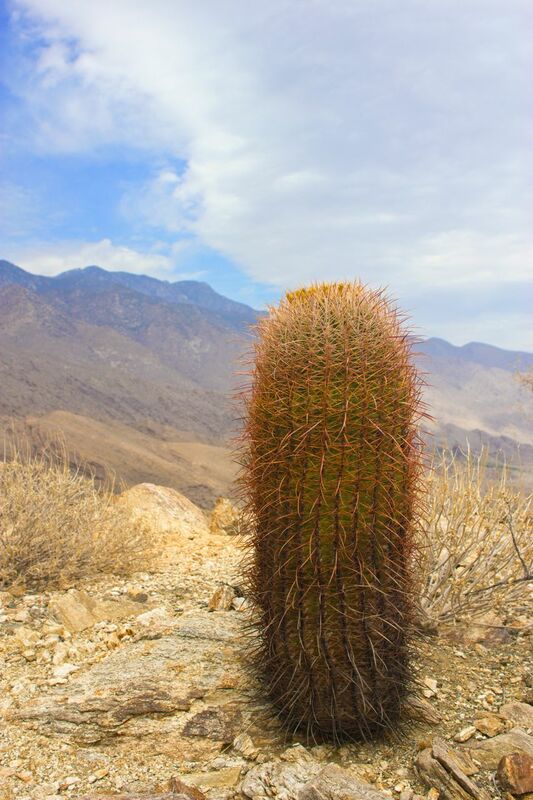 What is in the park, much like what is in the Joshua Tree Park, is so untouched and unspoiled, it almost seems like it is not of this planet. I admire the foresight to say, “This is hands off to development.” Because truly, what is in that park is special and should be beyond the scope of development and manmade change. 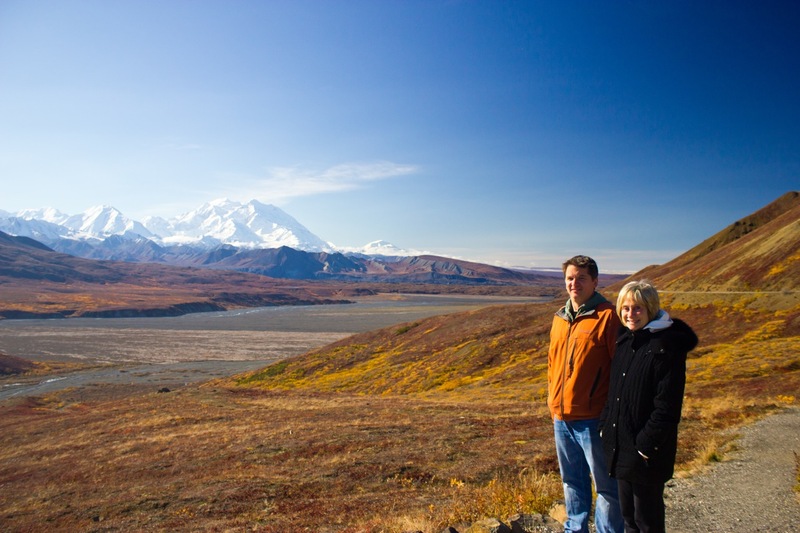 The thousands of millennia that have shaped this place–the wind, glaciers, water, and ice–have shaped this into an amazing and breath-taking place. I love the way the mountain slowly comes into view as you drive closer to it. It hides beyond mountains and then peeks quietly over the top as you get closer. I loved the illusion of it slowly revealing itself on the road. This picture shows that as it peeks out across the golden landscape. 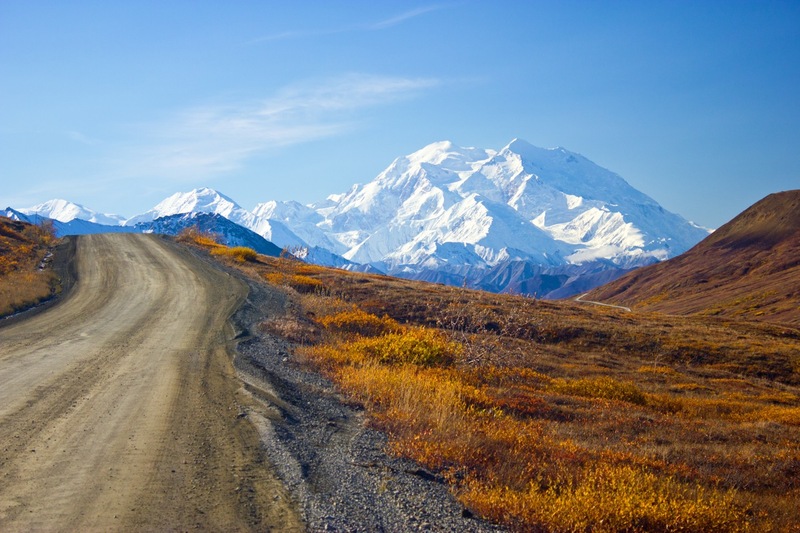 Denali is about four hours from Anchorage, so after the trip, I had to drive home. I hit the road at about 7:30. 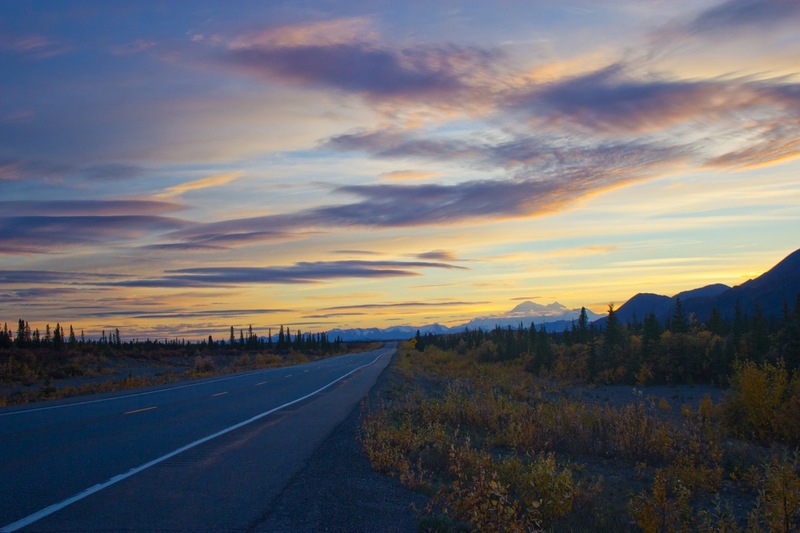 As I drove home, I was greeted with a lovely sunset in the pass, shortly before Cantwell. It was a fitting view for a glorious day. See below for the entire gallery of shots from the day in the park. The final week of the 365 Photo Project was crazy. From the sun and sand of Puerto Vallarta to the snow(!) of Anchorage. It was quite a finish to the project. Tuesday, we went on a dolphin watching and snorkeling trip. We went out to the Marieta Islands. We were told it is the Galapagos of Mexico. It was awesome scenery and pretty good snorkeling. I can’t say my underwater pictures were all that great. 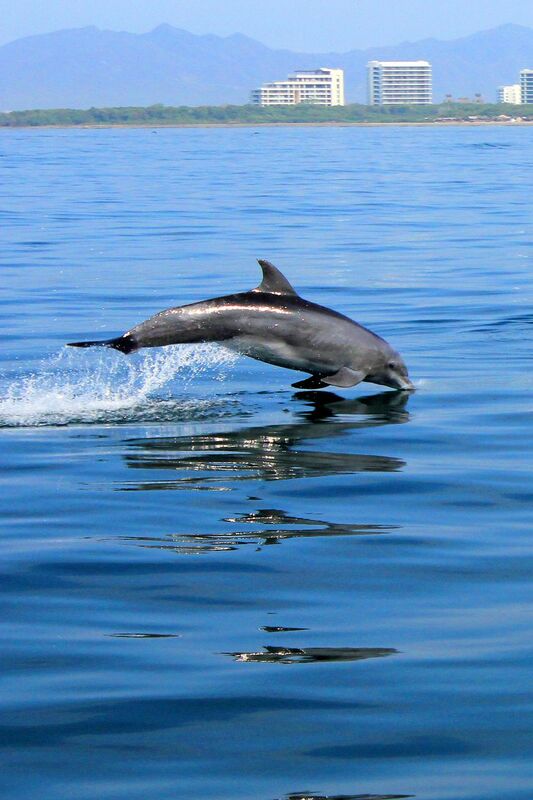 However, I did get this dolphin shot. I’m pretty proud of this one. If you keep your finger on the shutter long enough and capture enough frames, you will get lucky! The final full day in PV took us to the beach for some final rays. We spent the evening walking around the old town part of PV. We went to a beach bar and had a beer while we watched the sun go down. I took a bunch of shots. There was a guy fishing and he was throwing fish into the air for the frigate birds. He was doing it for me so I could get some shots. I got this one. How lucky was this! I really love this shot. The colors are great, although I did have to do some processing to get them to come out. I like how it is framed. It is one of my favorite shots from my 365 Days. 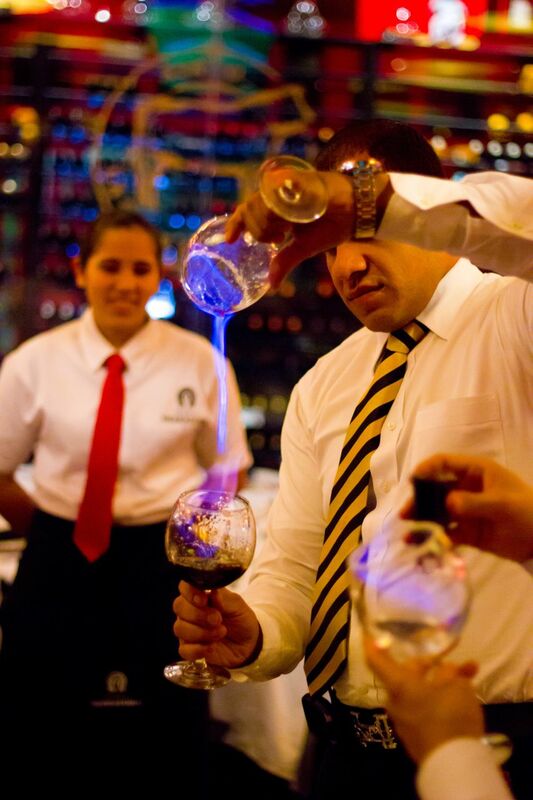 Later we had dinner and a nearby table ordered Mexican coffees. I’d never seen this done before. What a lot of work! But it was so cool. 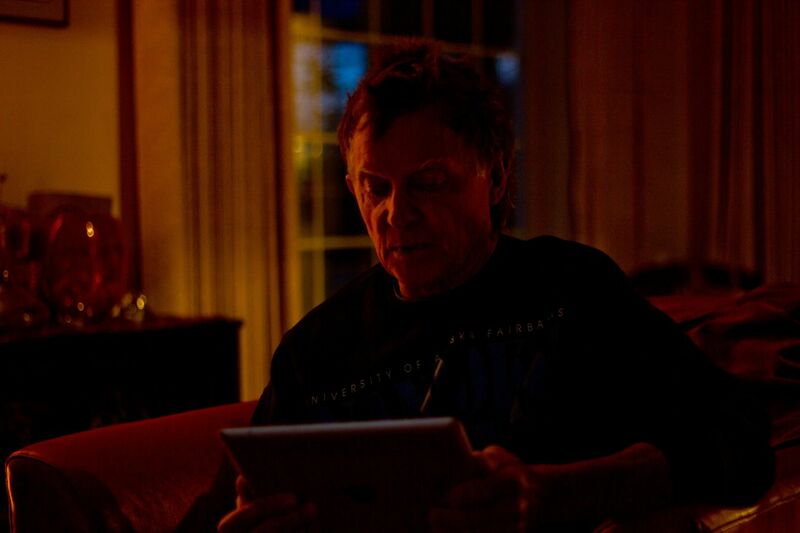 I was glad I had my nifty fifty with me to capture these low light shots. 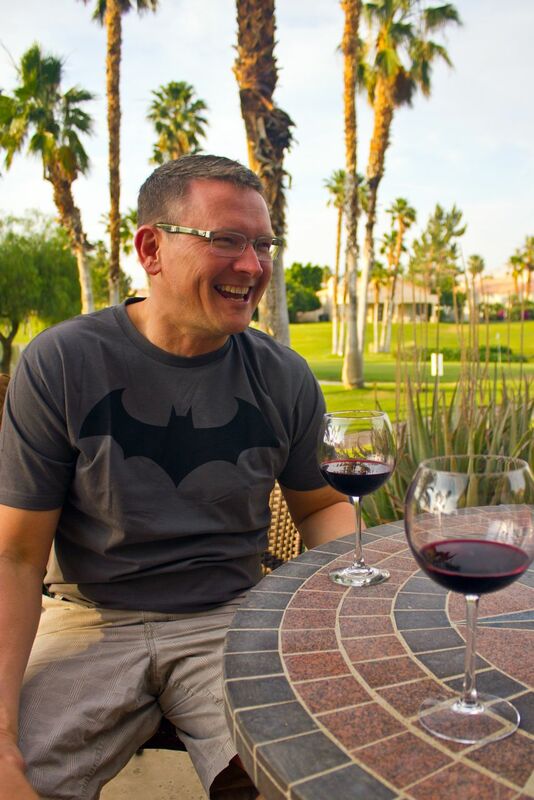 Ah, the final day in PV. We got up early, had breakfast and did some trinket shopping. There was this glass place that had this wonderful reflector. Here is Evan looking on through the reflector. Then I saw this guy on a burro and took a couple of shots. He was quite nice, and even came over to us to get a less candid shot with Evan. 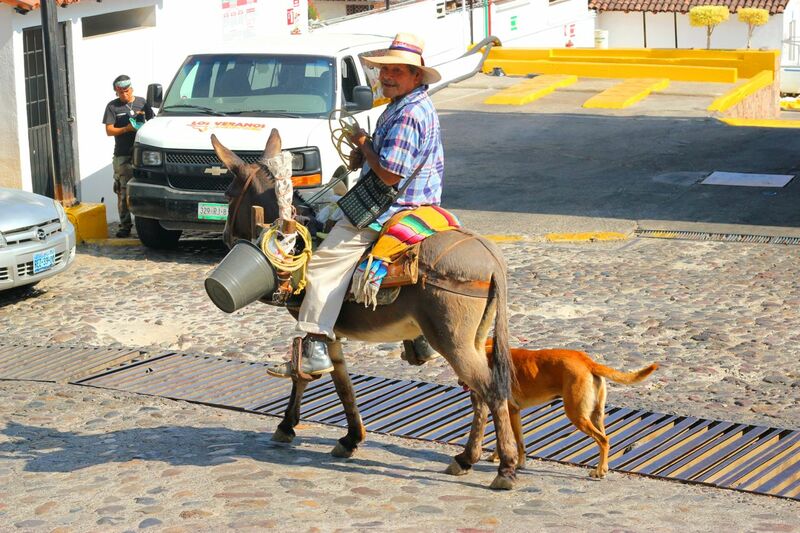 Then he politely demanded some pesos. We obliged. He did cross the street to get a picture with us. It was just like being in Times Square when those costumed characters want money for photos. Then we returned home to this. Yeah, it was snow. On May 17. No one was happy about this. It did melt, but it snowed a lot over night. This is what May 18 looked like! The snow was all more or less gone by Sunday. Winter would not let go. As I was nearing completion of the project, I wish I could say I was filled with a sense of creativity and urgency to have amazing final shots. I can’t. That’s why I took a picture of this bird house. It was the best I could do. Notice there are some buds on the trees. It’s May 19th! The last shot of the week, the penultimate shot of the project was to remind me that new life is coming. 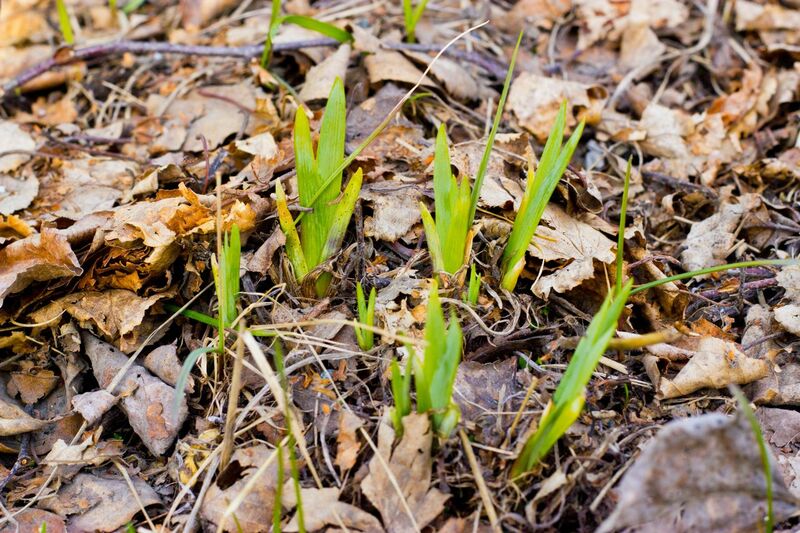 These are Iris popping up from the ground. A new beginning as I bring this project to a close. If you want to see the final post of the project, which as done on the final day of the project back in May, check it out here. How does one bring something like this to an end? It’s rather unceremonious to just end it. But it also seems fitting. It is nearing July, as I look back on the waning weeks of my 365 Photo Project. I’m realizing that I miss doing it. There was a sensibility and way of looking at the world that I have put away. But that is not the reason for this entry. Week 49 saw time with both of our dads. Not much of a theme, I grant you. 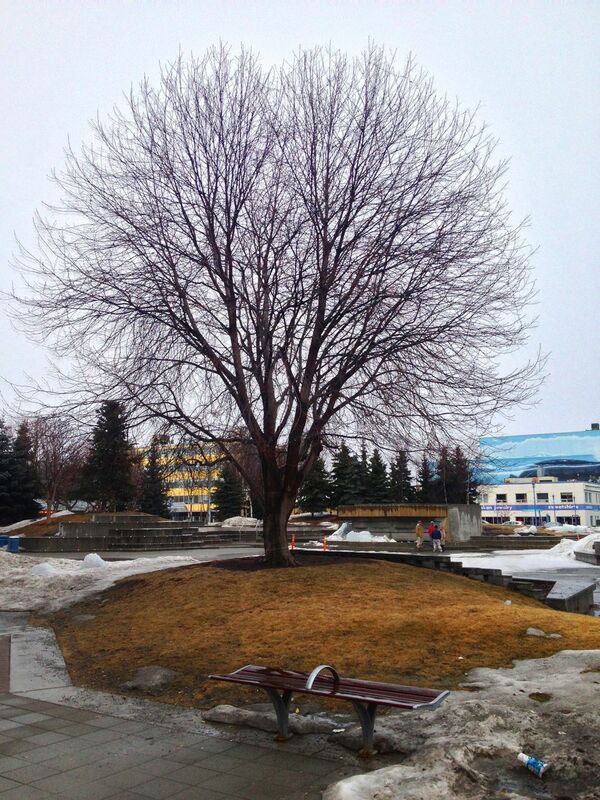 Tuesday shows a Choke-Cherry tree in the park in downtown Anchorage. When I took the shot, I would have told you there would be leaves and flowers on this tree in a month. There wasn’t. We had late season snow in May. Those pictures will come. Notice the snow and ice still in the park from the late season snow we had already had. 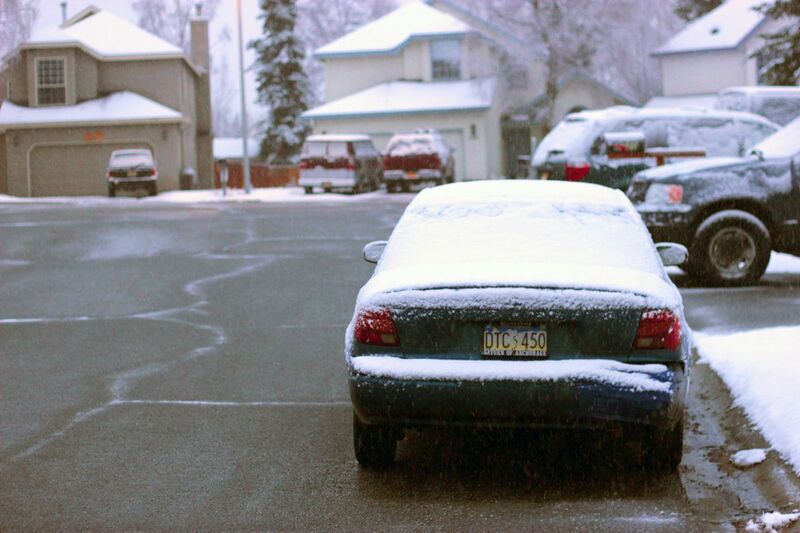 Spring was trying to take hold in Anchorage in late April. 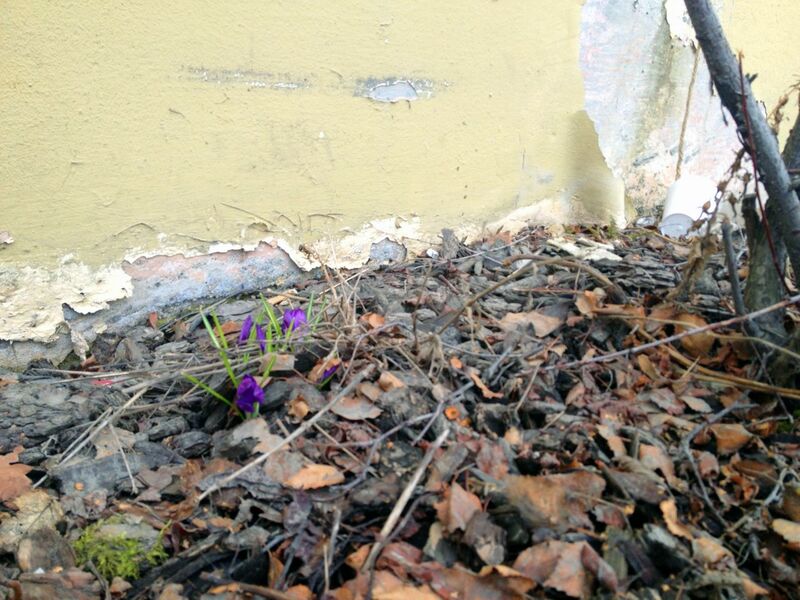 These little purple flowers were one of the first signs of plant life I saw. Not sure what they are, but there were on the west side of a building where sun is getting to be abundant. My brother and father made an appearance in Anchorage from Fairbanks. This was time with dads number one. I like this shot of him in the lamp light of our house. You can also see some of the waning daylight in the window behind him. This was taken late in the evening, around 10-11. You can also see how the light is rally making a comeback. 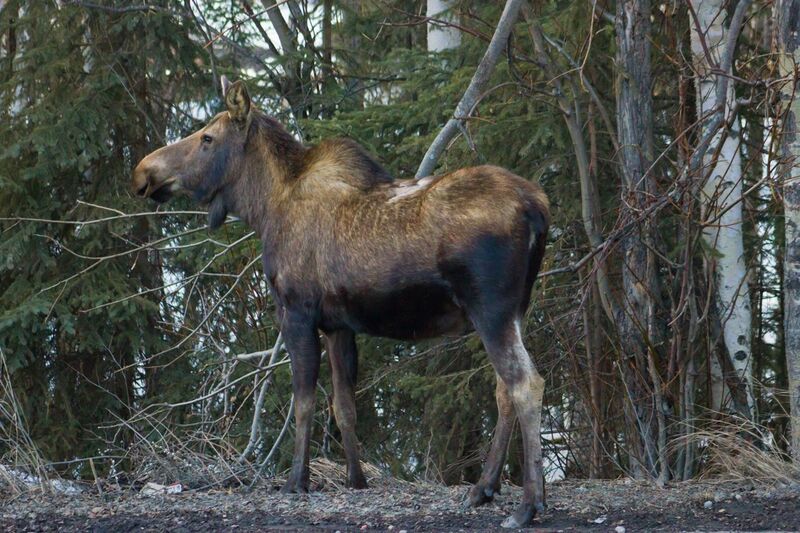 Moose are a common enough sight in Anchorage. And for some reason it was very important that I get a moose shot for the project. And I can’t believe I went nearly the whole year before seeing a moose on the loose. This little guy was on the street of our house. Kind of a small one. No cow around, so I imagine he was recently let go by his mom. As we drove past him, I shot a picture with my iPhone, and the moose tried to stick his head in our car. That was exciting! This was shot with my long lens for the safety of my front lawn. We had an early birthday party for Ernie, Evan’s dad. This was time with dads number two. 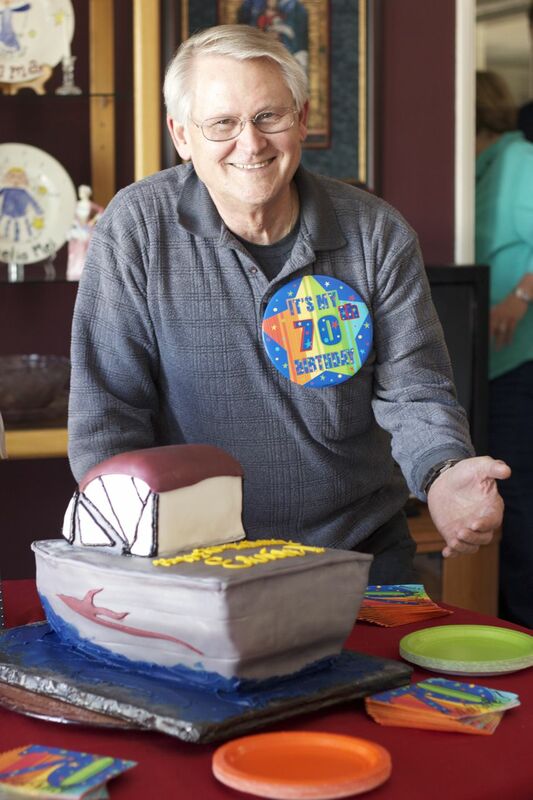 He loves his riverboat, so we had a local bakery fashion a cake in the shape of his boat. It was a really cool cake. 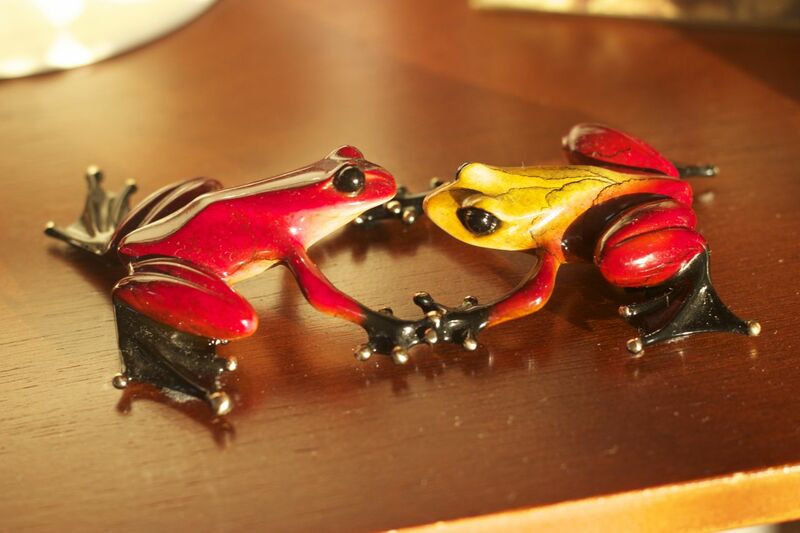 I’ve become fascinated with stop motion photography. While watching some videos on Vimeo, I noticed there are iPhone apps that help you create stop motion videos. And there are free ones! 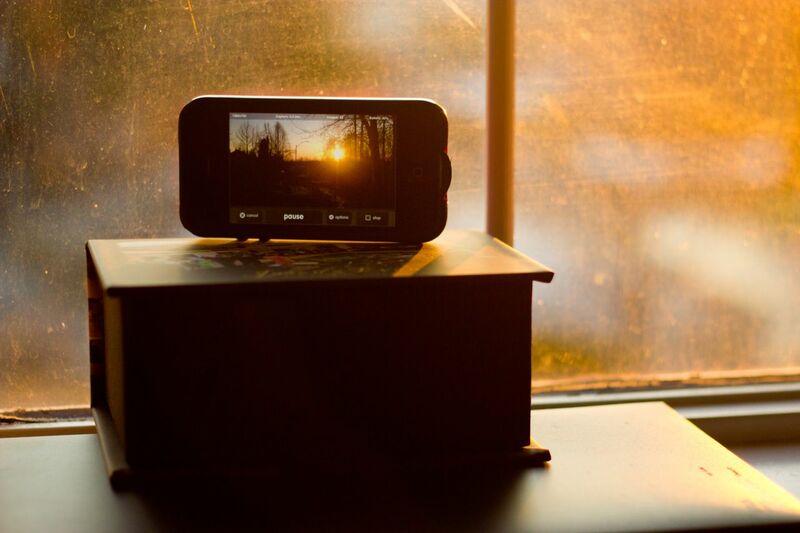 This shot was taken of me taking a stop motion video of the sunset. The app I was using is called iMotion HD. It’s a very cool app and so easy to use. I plan to post the video of my first video. I found myself still shooting late in the evening, so this was another sunset shot in our home. 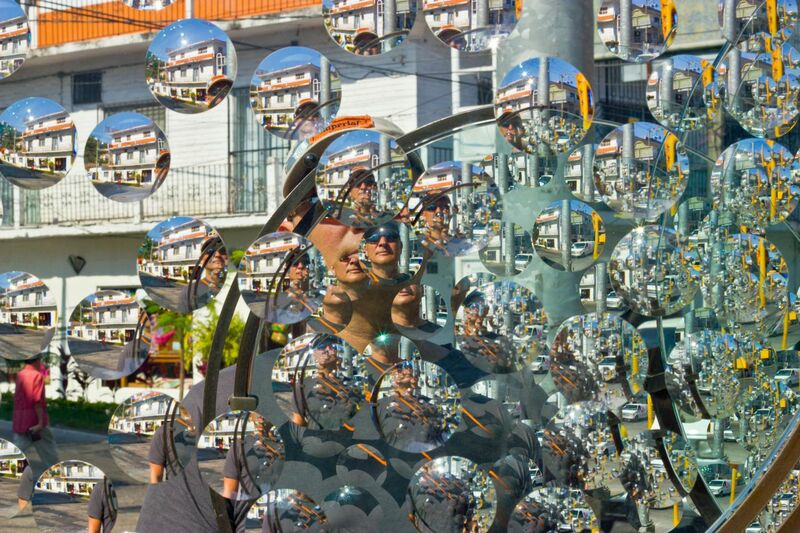 It’s not one of my favorites, but I like the new perspective on the same scene through a mirror. Looking back, I wish I’d done a mirror series. Ideas for a new 52 week series, I suppose. Looking back on this week’s photos, as with Week 47 of the 365 Photo Project, I unintentionally continued my sun study. 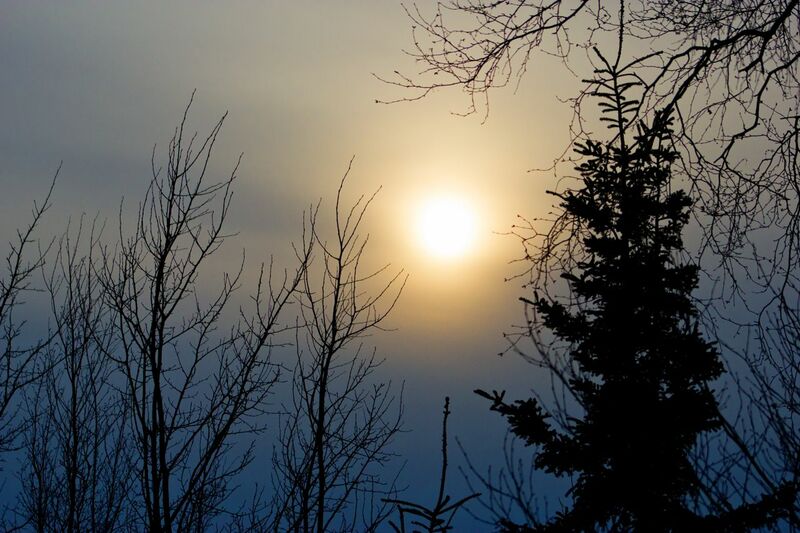 As I said in last week’s post, the sun is a big deal as it comes back in Alaska, and as I look at these posts, I realize there was a renewed energy I was feeling with the sun’s return and longer days. I can’t say I was terribly creative or trying to find new things to shoot. However, I was trying to push myself to find new ways to shoot the light in my otherwise ordinary home and surroundings. Tuesday we ate hamburgers and made pomme frites. And I love ketchup. Here’s our bottle of ketchup in the sunlight on our dining room table. And now nearly two months later, we are still out of ketchup. Wednesday was shot in the morning before work in the kitchen. As I’ve mentioned, our house faces east west. The kitchen get the eastern light. This morning, the wine glasses had a lovely light on them. They were drying on the dish towels. On Thursday, I shot the yard in front of the house. I’ve taken many shots here, but I liked the shadow the cherry tree was making on the snow and the golden light. This time of year the light and shadows are different than earlier shots I’ve taken. On the way to work on Friday morning. The light was up and beaming right at the Atwood and ConocoPhillips buildings. It was blinding as we were driving down the street. Once Evan dropped me at my office, I walked back to shoot the two buildings from different angles. This was the shot I liked the best. 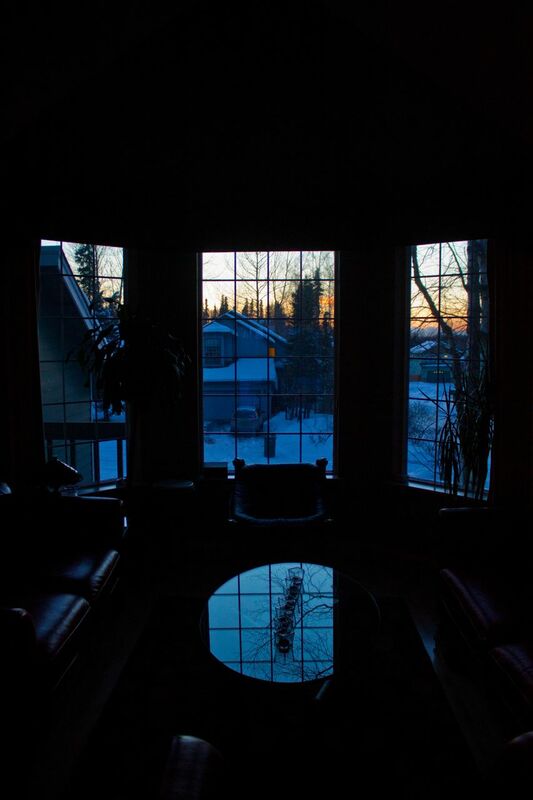 As the sun sets, we get the most beautiful light in our entire front room. It just fills the room with golden light. This shot on Saturday was my attempt to capture a little of that. On Sunday, I shot Evan’s glasses on the dining room talbot reflecting the light. On Monday, I took two shots, even though one would have been fine. As you can see if you’ve been following this blog at all, the sun is moving further north as it sets. 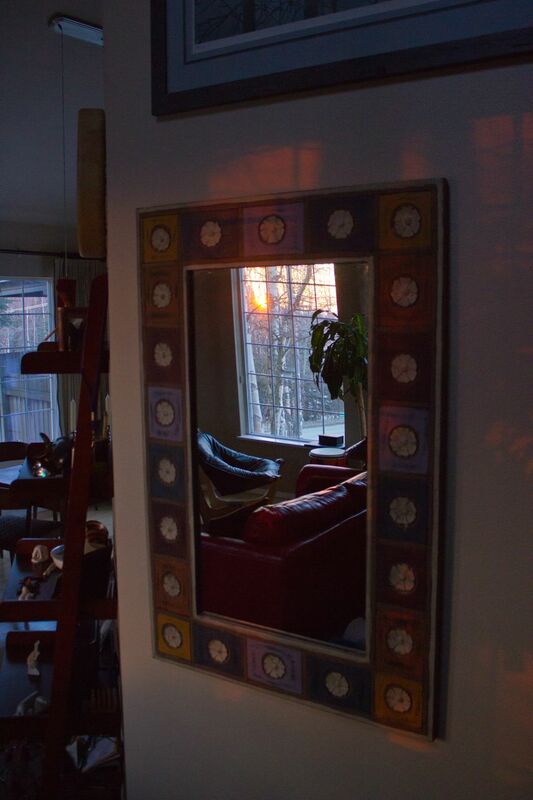 I took a wide shot to show the colors of the sunset and then a closer one to get a more abstracted view. Next week is some thing of a potpourri of shots. 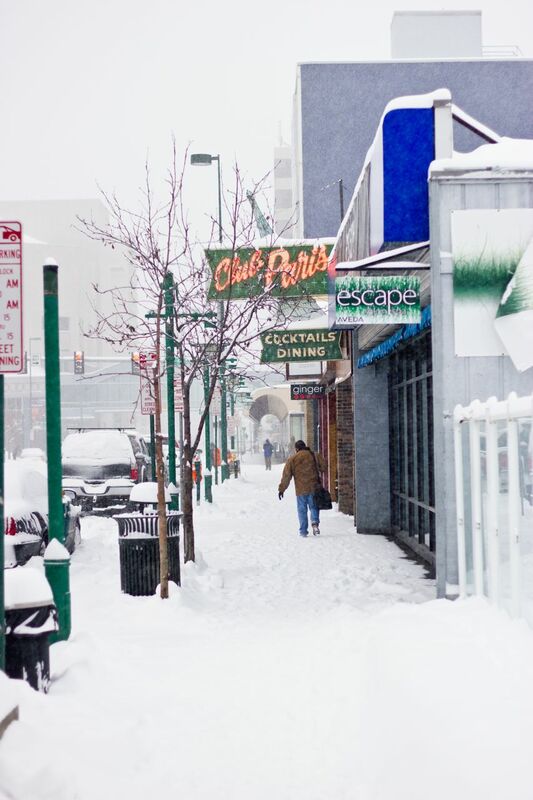 As we headed into week 44, everyone here in Anchorage, Alaska thought we were getting a reprieve from winter. This was not the case at all. We had a ton of snow that we were not expecting. For goodness sake, it was officially spring this week! I continued shooting in RAW mode. There is a little more work involved in the post processing, but the results are 100% better. 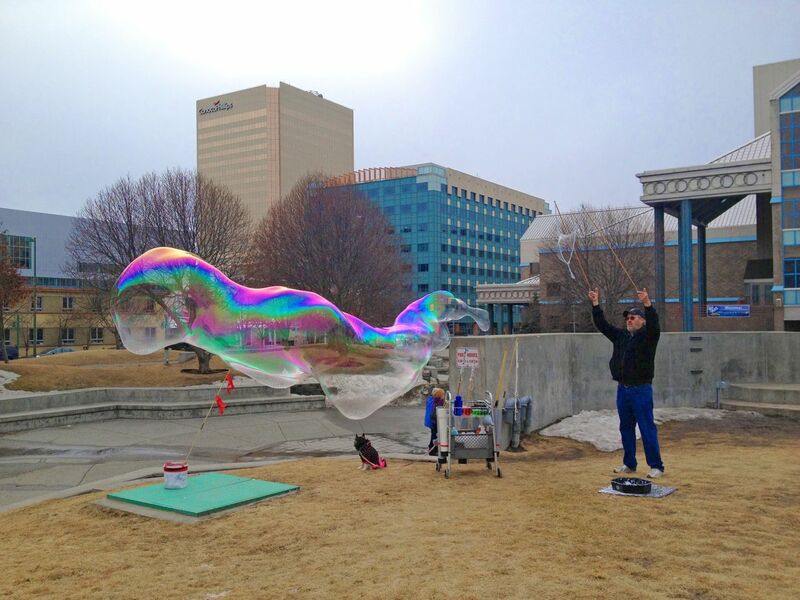 If you’ve not tried this with your DSLR, I highly encourage it. I know the point of the 365 Photo Project is to choose ONE picture for the day. I was more indulgent this week and kept more than one shot on a couple of days. Like on Tuesday for instance. These two shots were captured late in the day. The first was an abstract attempt at capturing the sunset. 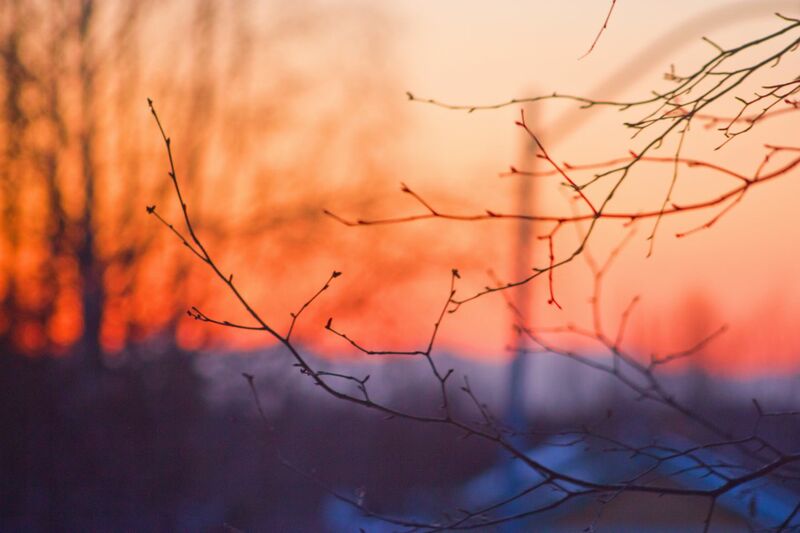 I like the little birch branches and the color from the setting sun behind. I also like the colors of this time of year. The stark cool blues right up close to the warm reds, oranges, and pinks. The next shot is of the same sunset, but zoomed out and less abstract. Again, the colors are stunning. And little by longer the days are getting longer. This picture was taken 10 minutes later than the one last week. The next day, as I was coming home from a late board meeting, I got the sun as it was going down. The green house on the left is the same one from the picture above to give you an idea of how close I am to the same area. This road is just to the north of my living room. Clear skies gave way to some clouds. 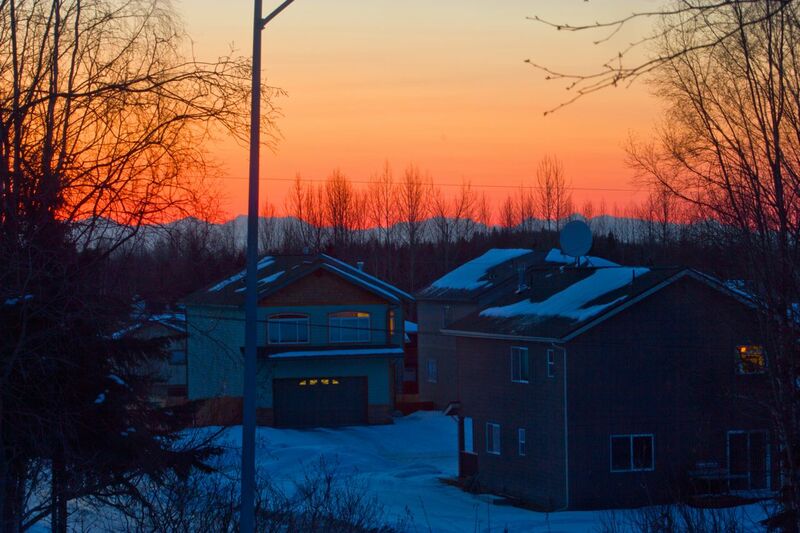 Some friends who live on the water of Cook Inlet invited us to dinner to see the spectacular sunset from their house. But the clouds kept us from seeing that. Still the light was wonderful this day. I like the palette of the colors and silhouettes of the trees. I like the simplicity of this shot a lot. 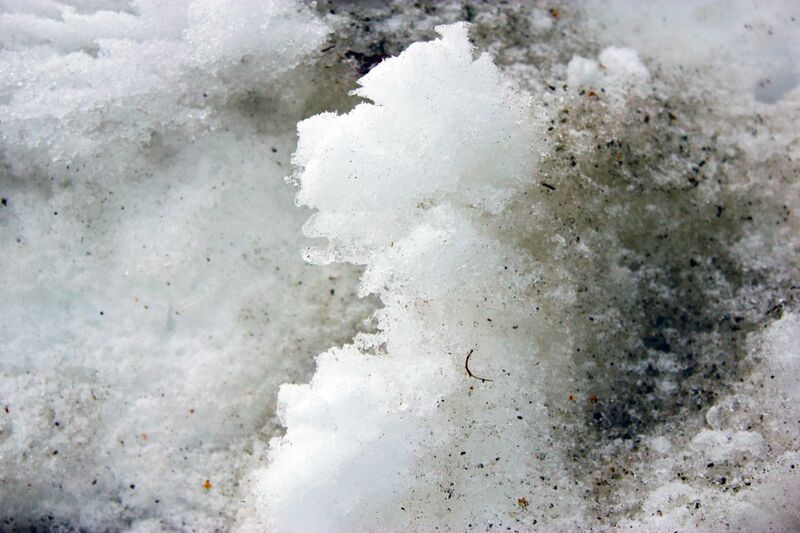 On Friday, I got a shot of more melting snow. I was more interested on a detail level and getting close up on the way the snow looks as it melts. Not my best or most interesting shot, but there is nice contrast in the show and dirt and melt. We did seriously think we were out of the heavy snow season, but we got a dumping on March 23. I went for a walk to practice shooting in the snow. I need to make a separate entry for those shots. Here are three I liked from my walk that Saturday. 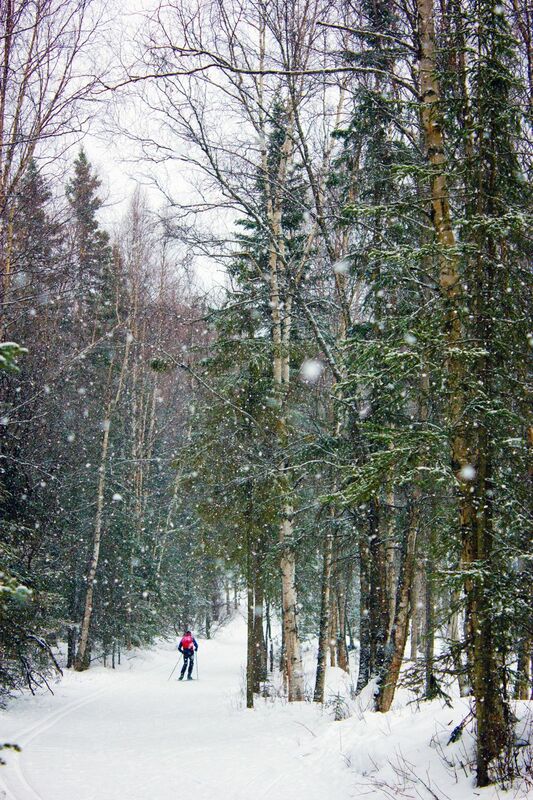 I like the composition of this shot with the green trees framing the journey of the skier in the snow. I like the foreground grass with the open background all the way to the trees. 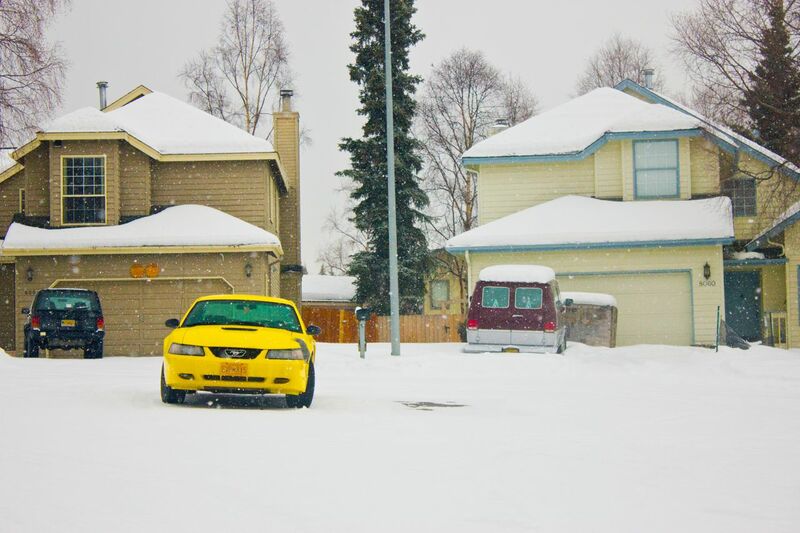 Finally, I like the color of the yellow car on the white snow. I did photoshop this one a bit to get the car to pop. 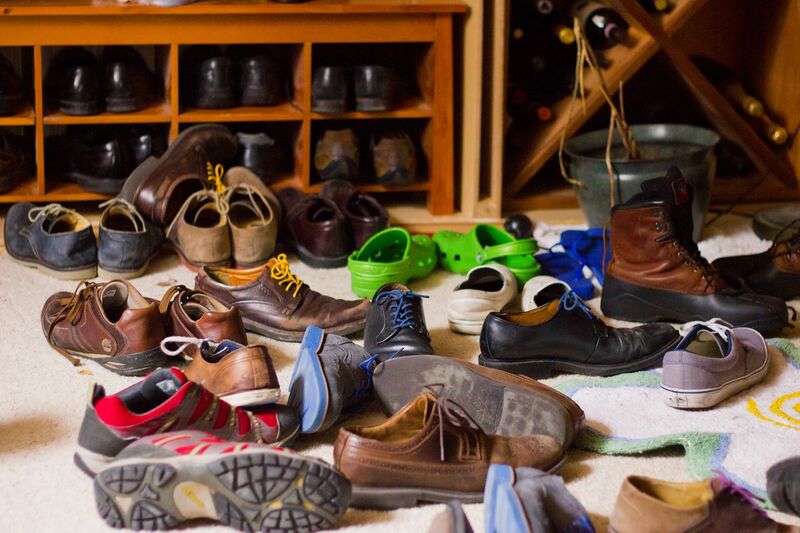 On Sunday, I discovered we have a lot of shoes and documented this fact. As I was sitting on our couch I looked out at our bonus room and loved the way the diffused light was hitting the shoes. Soft shadows and well lit shoes. It’s chaos in the shoe room. We need some help. And the crocks were a gift from my staff as a joke. I take exception to people wearing crocks in public. And pleated pants. Both big fashion no-nos. I only wear the crocks with a blistering sense of irony and around the house. And on Monday, we had ANOTHER big dump of snow. Here again I like the white of the snow and the colors popping out of the signs on the street. 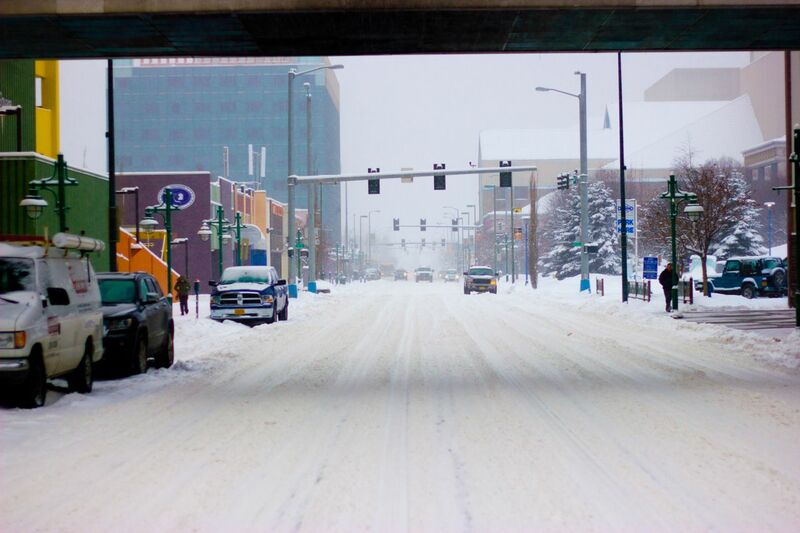 This is Fifth Avenue in Anchorage. And this is Sixth Avenue. Look at all that snow. Was it snowing well into Spring where you lived? 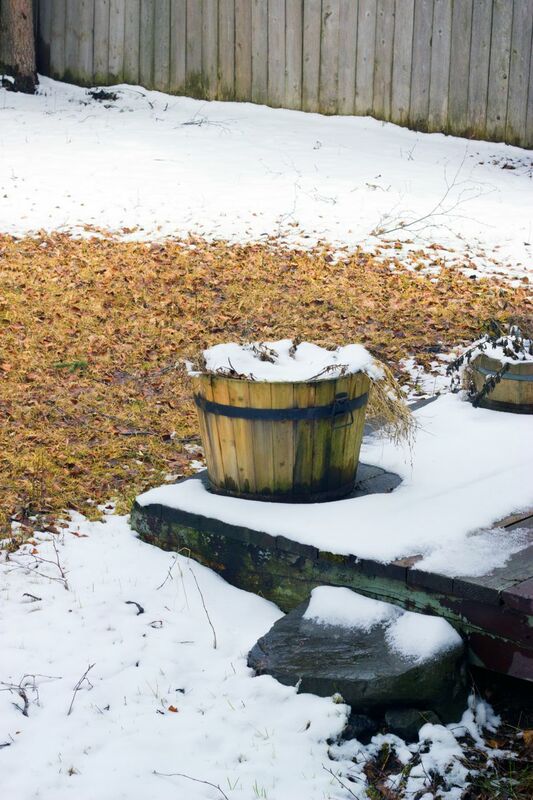 Did you take snow pictures this season? 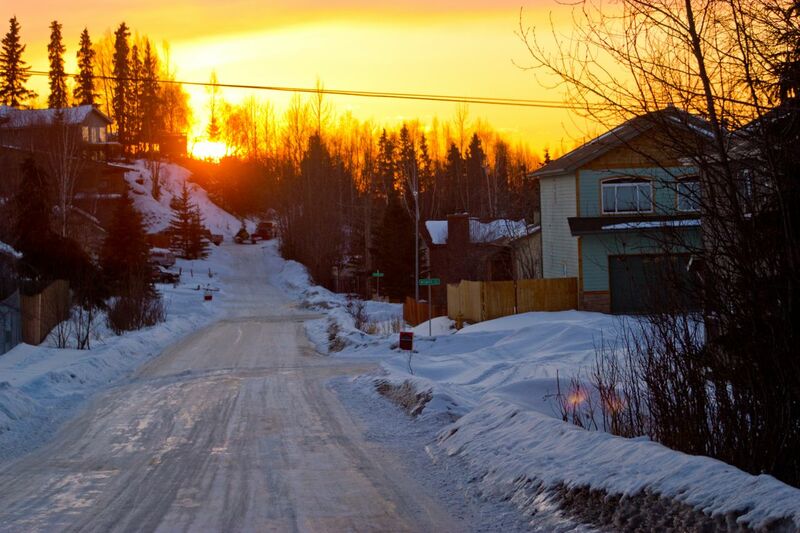 In March, as we Alaskans approach the vernal equinox, the light becomes more and more important to us. On March 21 or there abouts, we are back to being at 12 hours of daylight and darkness. It’s a big deal. Our house is an east-west facing house. 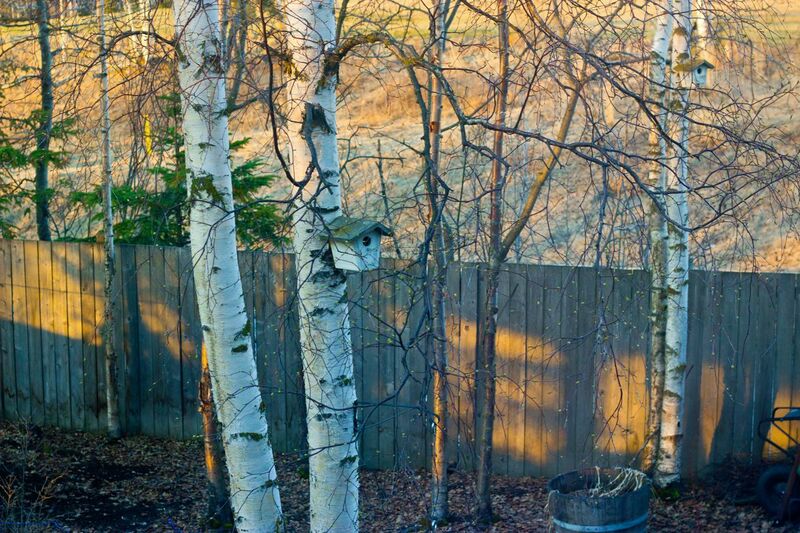 In Alaska, a north-south facing house is a little more desirable. However, this time of year and into April and May, the east-west facing is breath-taking for the light we get. Some of the pictures this week took advantage of the every-increasing day light. The picture below was taken at 8:23. It’s our living room looking out to the west. It’s now April 21, and we’re at full daylight until almost 10 P.M. Daylight comes on fast up here. I like the reflection of the light outside on the glass table. 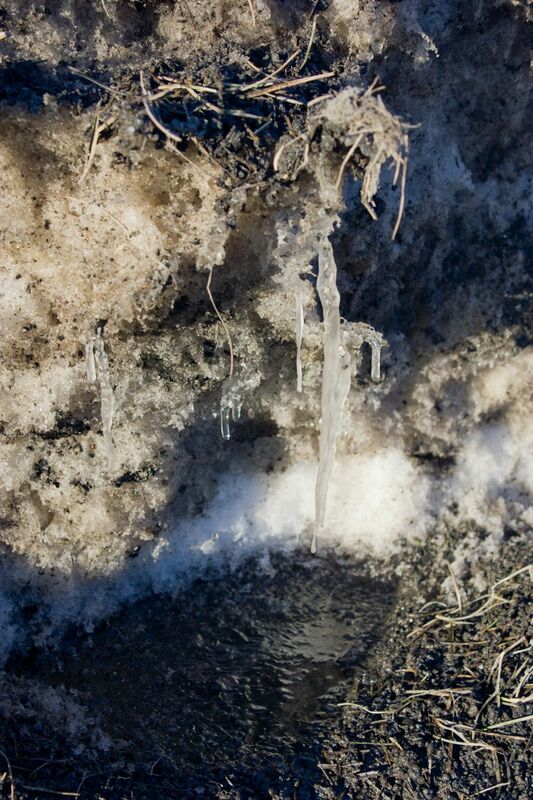 As quickly as we get snow, it begins to melt as the sun gets higher and higher. This is a south facing bank that was beginning to melt. We get lots of white beautiful snow that slowly melts into ugly gray patches. 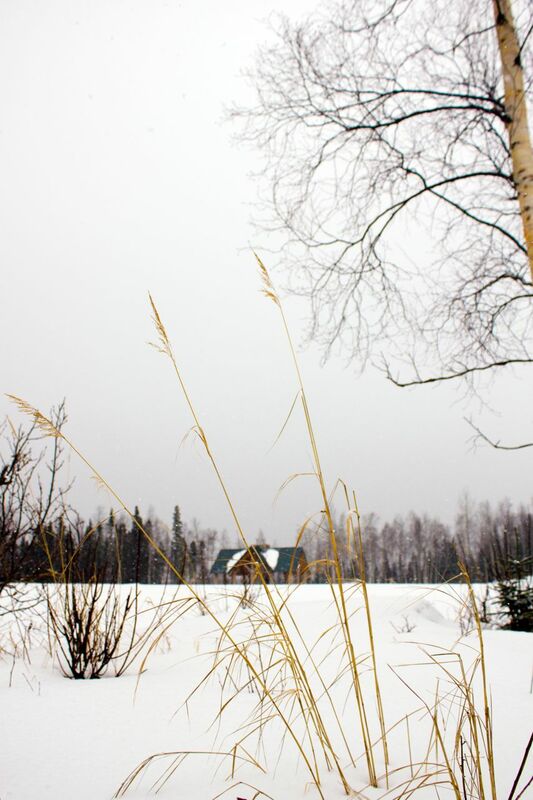 Spring is not our most beautiful time of year in Alaska. I’ve noticed when writing this blog, I tend to take pictures at home, at work, and at the gym. These are three places I tend to spend the majority of my life. I’m not sure that is a bad or a good thing. 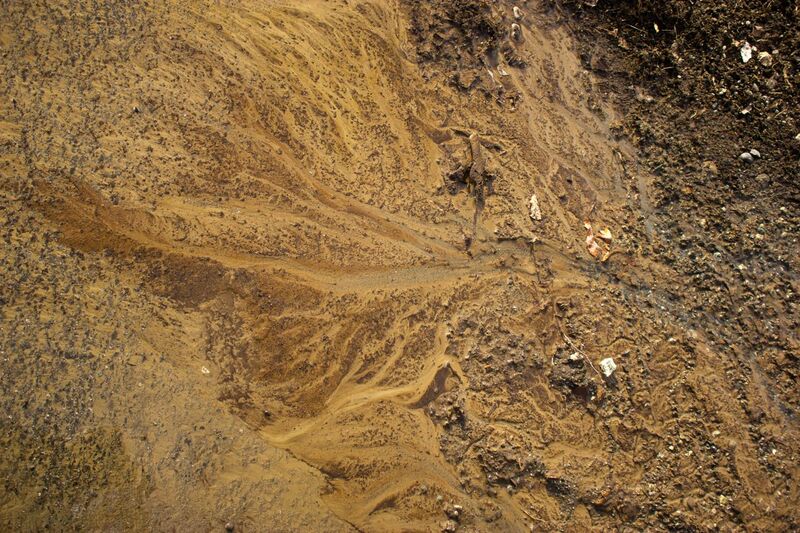 In Alaska, when the snow melts, it can be a time of surprise. Stuff comes out of the snow. 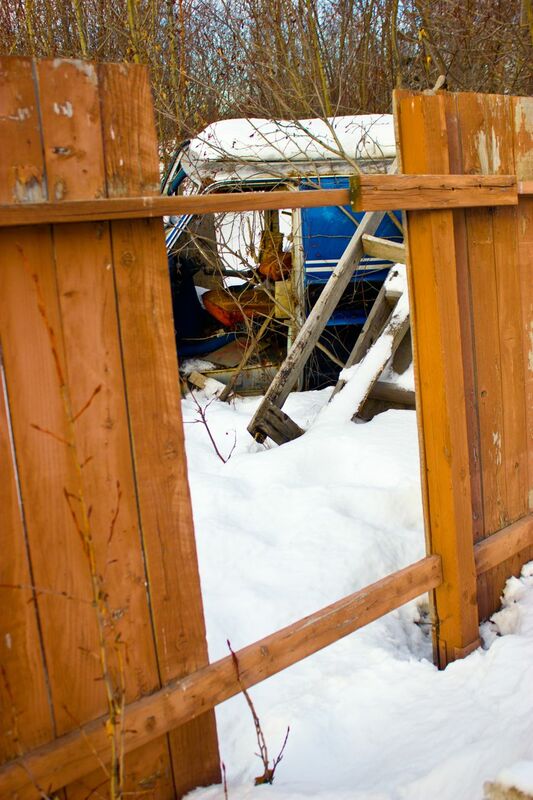 I liked this shot because of the hole in the fence, the snow, and the mysterious crap beyond. 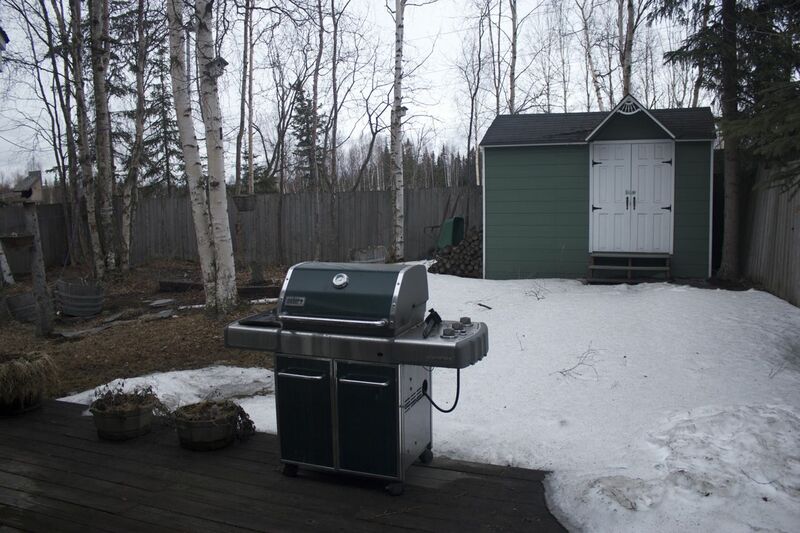 This is a typical Alaska spring time shot. 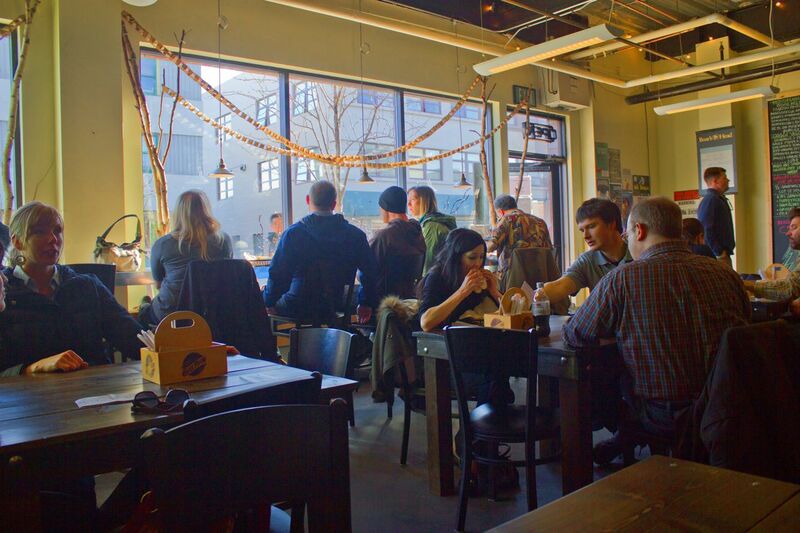 I went to lunch on Friday at Brown Bag Sandwich company. Good sandwiches. And a fun place to get some candid shots at lunch. 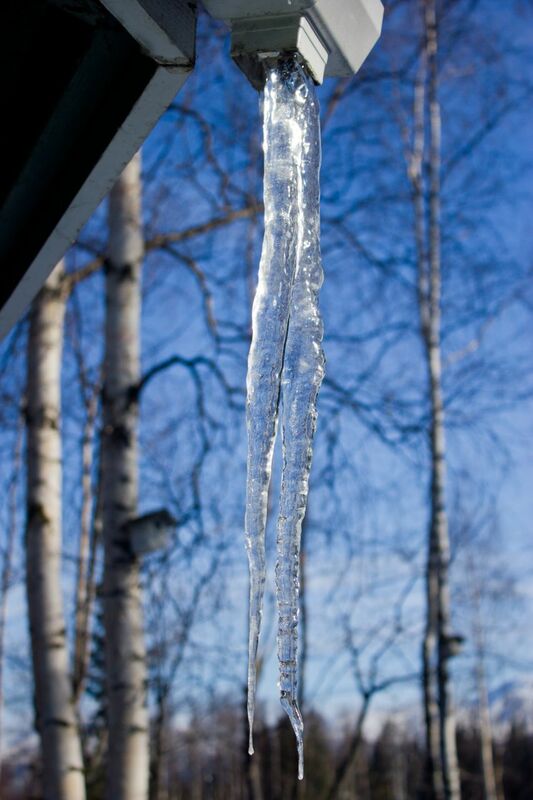 What is spring without some pictures of icicles? This was one growing in our back yard. The freeze and thaw makes for some big icicles. This isn’t the biggest one I’ve seen, but it is pretty good sized. I like the focus on it and the fuzzy background. The light on it is also pretty. 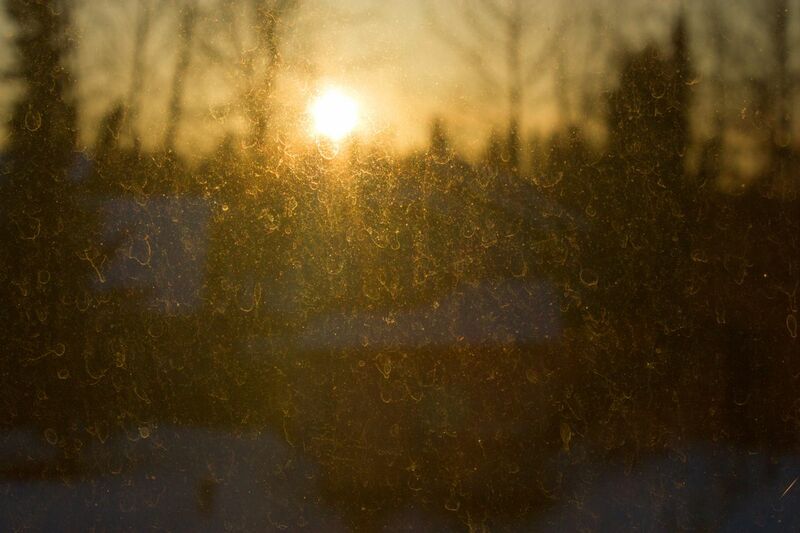 As the light comes back and pours in our living room windows, it reminds me we need to clean the windows. But it is too cold outside to do that effectively. Regardless, the light streaming in is gorgeous. I liked the dust specks and the out of focus background with the light. 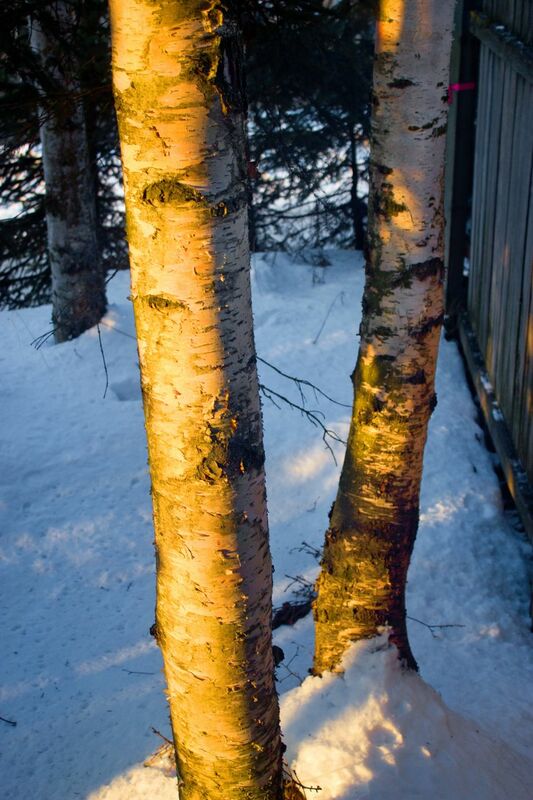 There are few things as beautiful as birch trees in snow with sunlight on them. I didn’t have to go far to get this shot, it was right outside my dining room window. I wasn’t lying about how beautiful the light is this time of year. I should probably photoshop out the marks man’s tape in the upper right. 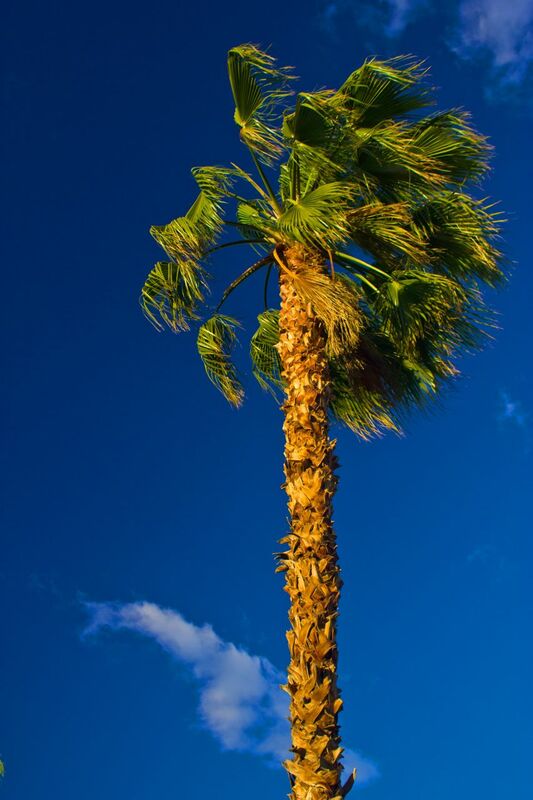 What is your favorite time of year and time of day?